Another speedy little handmade gift project. 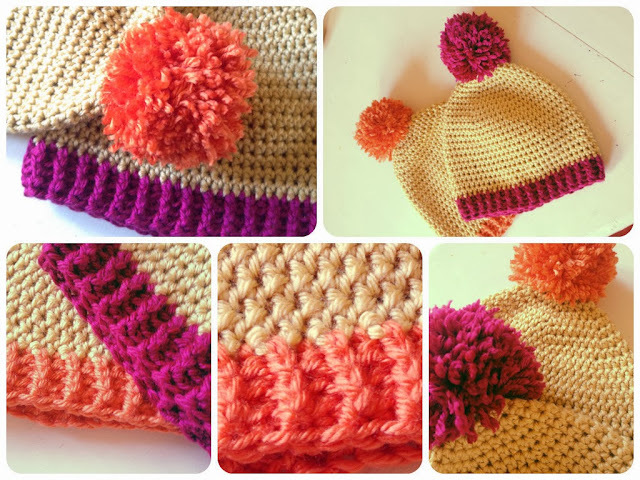 This time bobble hats for little ones. I love these little hats, destined for a pair of twins, I used Red Heart Soft that I had left over from my Rainbow Slipper Socks, which is fabulous for this sort of project, soft, washable and available in a great range of colours. I made the pattern up as I went along, working top down in half treble stitch (possibly my favourite of the crochet stitches!) I worked in continuous rounds and then added a contrasting band of treble crochet as ribbing along the bottom. And of course a pom pom on top! To make my pompoms I just use my hand and then trim the up to make them even. Quick and easy each hat took me an evening, but they're super cute and fun.